I’ve been interested in the Stanley Milgram experiments for a long time — the “obedience to authority” ones, more than anything else, though as Gina Perry pointed out, he did other startling and original research. For example, that idea that you’re only six degrees of separation from someone else? That was his experiment. The one about good will, testing whether people would post letters just left out, and how many would respond based on the addresses on the envelope? Also Milgram. Part of Gina Perry’s focus in this book is unpacking how people felt after they were the subject in the experiments. She met some of them for research, listened to the transcripts and the follow-up interviews, spent hours with the material. And some of them really were traumatised by what happened under the experimental conditions: some of them weren’t ‘dehoaxed’ until months after their participation in the study. They didn’t know that they hadn’t really come anywhere near killing a man. Some of the ethical problems with this study are astounding, and Perry unpacks them nicely. One of the things I think people find harder with this book is her outlook on Milgram. She started out being an enormous fan of his work: it was only when she dug deeper into it that she began to feel ambivalent, even a little horrified. I wonder if people would feel the same unequivocal admiration for Milgram if they could listen to those transcripts, all of them, and experience the way he went on with the experiments despite the distress of his subjects. 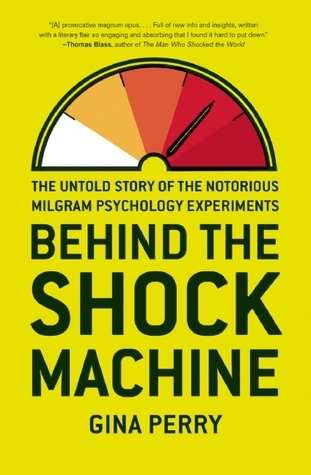 It certainly sounds from this book like Milgram’s results were nowhere near as clear-cut as he presented them. For example, everyone knows that the outcome is that “most” people would obey an authority figure to the point of killing someone — but the fact is that 65% did. That’s still the majority, but that includes people who weren’t sure if the shocks were real or not as well as people who were sure they were real, and it also includes people who protested all the way. It does show the effect of pressure by an authority figure, but the picture is a little less clear than we tend to think. And then there’s the cherry picking of his results. For example, condition 24 showed only 10% obedience: that was people paired with people they really knew. Authority can’t overcome personal relationships. Milgram never published about condition 24. Despite being a fan of his work, Perry didn’t know anything about it until she found the records, bundled in with those of condition 23. It’s true that Perry has an ideological position on Milgram, but it’s fair to say that from her account, that arises from the depth of her research. I don’t think anyone going into the impact of the experiments could avoid it; she doesn’t claim to be writing a book about the scientific principles, but about the people involved. I think she does a fairly good job of presenting various sides of all of them. Overall, I found this really fascinating, though I do always keep in mind that non-fiction is no less ideologically charged than any kind of writing. Of course Perry has opinions, and her exploration of these and how they developed during her research are a key part of the book. It’s not the last or only word on Milgram. Such a balanced review, Nikki, another one that will encourage me to look out for this (perhaps to borrow, as I’m trying to reduce shelf space). While my wife’s always known and told me about reservations concerning this particular Milgram experiment, I hadn’t really taken on board just how unethical it was — by today’s standards, if not officially then. It was really interesting, I recommend it. Especially because it takes a look at the ‘subjects’ of the experiment and re-complicates Milgram’s view of them.